When businesses suspect that they’ve got asbestos on the property, one of the concerns is that any removal work is going to be disruptive and cause a big mess. Managers are concerned that buildings will potentially be cut off for long periods of time while complex work is done on site. They’re especially concerned that any work on site will pose a risk to staff and cause a delay to current projects. Firstly you need to make sure you’ve actually got asbestos in the first place, but taking asbestos samples and running some tests. Once a professional team assesses the situation then they’ll be able to recommend what needs to be done on site – or even if removal is the right solution. Larger scale asbestos removal jobs can be complex, but there are good project management solutions in place to minimise any impact on a workplace. For example, when we had to remove corrugated roof sheets from Pear Tree Yard, we did this in two phases – first dealing with the main building, and then returning later to deal with the garage block. We’ve also worked at schools during the holidays, or businesses at weekends, meaning that any mess was confined to periods where people were not present. In fact, many people would never even notice the work had been done. During asbestos removal jobs, what usually happens is sites are pre-cleaned, staff wear disposable overalls and facemasks, and enclosures are fully sealed. That’s because for asbestos removal work it’s especially important to not release hazardous fibres into the atmosphere while we take out things like insulation boards – so we completely seal off a room in which we’re going to remove the material. It might be that reinstatement work is required to replace artex. This means the job can take a little bit longer, but the mess at this stage is the same as having the decorators come to work on a room in your house. Sites are fully decontaminated afterwards and then an accredited lab will come test the site for fibres. Essentially after a job is finished there’s no mess left over. Something else we’ve used on sites is a modular decontamination unit, which we’ve been able to place on business premises to ensure mess and risk is kept to a minimum. If the site is close to a public area then we’ll use Heras fencing to ensure people aren’t at risk by entering the area. What’s important to remember is despite the larger scale of project, we tend to work quickly and are flexible with the hours and days in order to keep disruption to business and people to a minimum. It’s in everyone’s interest. Don’t forget that not every case of asbestos needs a large-scale removal job. If the asbestos found on a site is in ‘good’ condition, then the ideal solution might be asbestos encapsulation. Not only is does this make much less mess and cause minimal disruption, but it is cost effective and can be dealt with very quickly. The process of asbestos encapsulation essentially involves coating the asbestos surface with a protective barrier, which minimizes the risks of future damage and disturbance to the material. 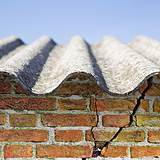 A flexible, high performing coating is sprayed onto a surface such as a roof, and this should prevent degradation of the asbestos for many years to come.